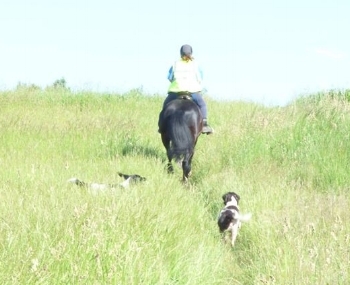 There’s a love-hate relationship between horse riders and dogs, especially when hacking out. To take our horses and dogs out for a peaceful jaunt around the countryside at the same time, no worries of one chasing a rabbit as the other spooks away, it’s a dream for many of us! Hand-walking your horse can sometimes be tricky enough, let alone taking your two dogs with you! “They are all well behaved thankfully,” says Ronnie Luise. Helen Chivers takes her dog Burghley out for company whilst riding Lloyd. Lotta von der Hyde and Sarah-Jane Ambridge recently took their dogs for a 5 mile hack around Harcombe Woods. 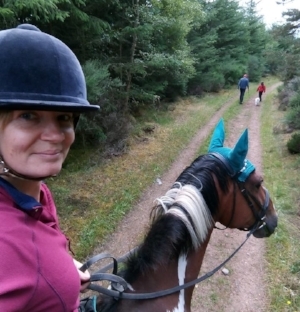 “Lovely hacking, dogs welcome and a car park dedicated to horse rides – perfect!” smiles Lotta. I’m a cheat,” says Lauren Maclean about hacking out on a family dog walk. 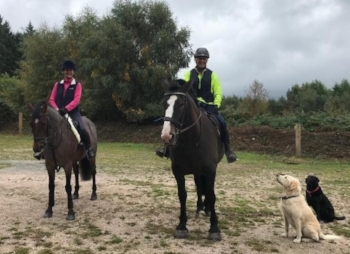 “My dog decided to join us instead of going for a walk with my mum and the other dogs!” laughs Louse Horwood about the tag-along of her recent ride. Danielle Rowles’ husband often accompanies her hacks with Blackie on his bike, and they take out three dogs between them! Wendy Barton also rides out with her husband and their dogs. “I love riding with the dogs in tow,” Wendy said. 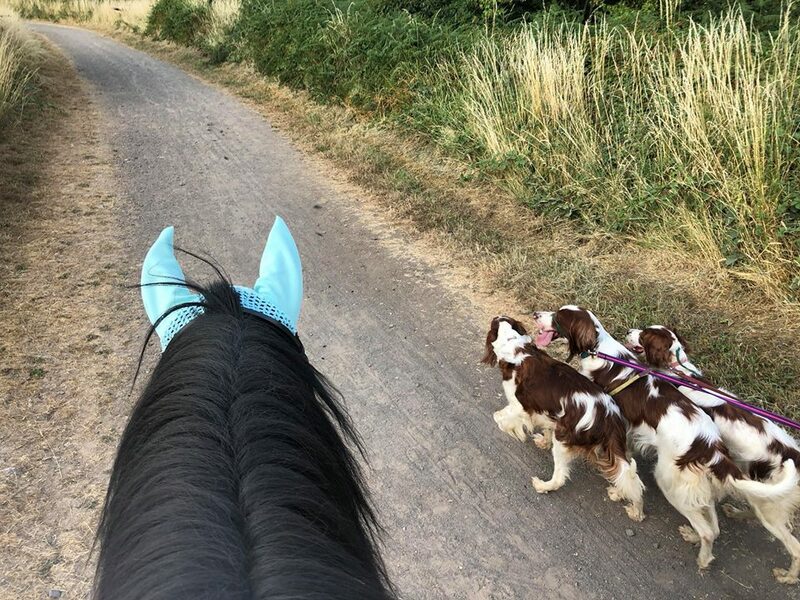 “We had the best company doing it!” says Stephanie Kings-Jones of passing the 150 mile mark during a ride with her dogs.